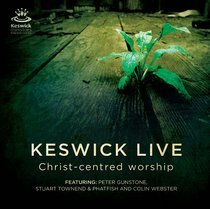 Live worship from The 2010 Keswick Convention. With worship leaders PETER GUNSTONE, COLIN WEBSTER, STUART TOWNEND AND PHATFISH. Join with thousands gathered in the Keswick Main Tent as they put Christ into the centre of their song. The Keswick Convention has long held a reputation for the vibrant, communal and inclusive nature of it's celebrations This is a chance to revitalise memories of the event or maybe experience for the first time those special moments when God moves in his people as they worship him. The Keswick Convention is the oldest of the UK's annual Bible conventions held in what is arguably the most beautiful corner of England; the Lake District. Over 3 weeks some 10,000 people will be encouraged and empowered by its rich mix of teaching, worship and relaxation. About "Keswick Live: Christ-Centered Worship"